If you're tracing the fantasy feature film back to its roots, most paths eventually lead to 1920s German silent cinema. Just as Murnau's Nosferatu and Carl Boese and Paul Wegener's Der Golem foreshadowed future developments in the horror genre, Fritz Lang's 1927 Metropolis is generally regarded as the godfather of the science fiction epic. It's one of the few non-comic silent films that even casual viewers are at least aware of, in part due to a preponderance of video releases and the variety of versions that have appeared over the years. 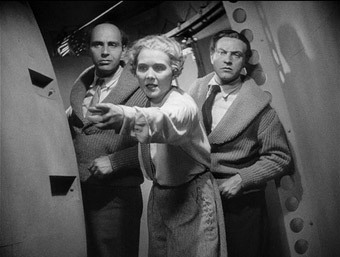 Less widely seen is the film Lang made just two years later, which in some ways is every bit as visionary as Metropolis. In some ways. Although a credibility-pushing spy yarn and relationship melodrama very much in the traditional silent cinema mode, it's also a forward-looking science fiction story peppered with uncannily accurate predictions for the future of space travel. But let's start, as the film does, with the fanciful drama. Professor Georg Manfeldt has lived in poverty for thirty years, having been ridiculed by the scientific community for his theories regarding the gold content of the mountains of the moon, which he claims could exceed the earth's own reserves. He only grudgingly accepts the occasional financial help of his close friend, successful industrialist Wolf Helius, who has for some time been planning a trip to the moon to prove the professor's theories correct. Despite his determination to keep the mission secret, word has got out and a group of powerful and wealthy capitalists, fronted by Chicago heavy Walt Turner, are determined to hijack the mission for their own ends, but Wolf and the Professor won't play ball. Wolf is also reluctant to tell his good friend and partner Hans Windegger of his plans, largely because Hans has just announced his engagement to pretty astronomy student Friede Velten, whom Wolf is also secretly in love with. When Friede and Hans find out about the mission they both insist on coming along, but when Turner arranges the theft of crucial papers from Hans' apartment and the bombing of one of his hangars, the group are reluctantly forced to include the unscrupulous American in their number. It's best not to approach Frau im Mond expecting the sort of naturalistic style and performances that made F.W. Murnau's late silent era Tabu – also recently released by Masters of Cinema – so striking. 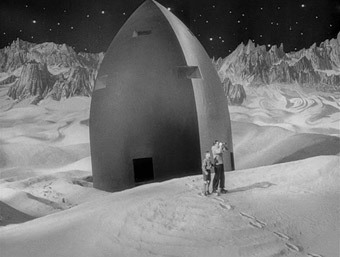 Frau im Mond is more recognisably in the silent movie tradition of uncomplicated characterisation and exaggerated emotions, something particularly evident in Wolf's anguish over Friede's love for another man, in just about everything Hans does, and in the spectacularly oily Turner, a gargoyle of evil grins and superior glares who immediately checks his appearance in a hand mirror after punching someone out and only lacks a moustache to twiddle as he makes his evil plans. 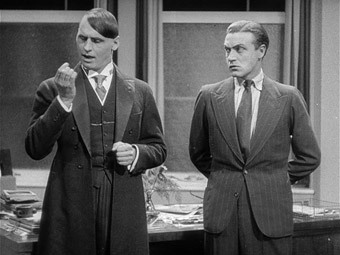 Lang often takes his time on these early scenes, with long dialogue exchanges playing out unedited and only the crucial aspects clarified by title cards. It thus takes 73 minutes to set up the plot and get to the moon mission itself, something I couldn't help thinking that Lang's fellow countryman Murnau could have compressed into a busy 20 minutes of screen time. That said, it's a journey littered with narrative and character intrigue. Turner and his cohorts are of particular interest here, icons of unprincipled and power-hungry greed not so different from the shady controllers of the current crop multinational monsters. That their henchman is an American gangster, a man who closes deals with a combination of blackmail and threats, can't help but cement this contemporary link. Their philosophy is handily summed up by the proclamation, "I, for one, want the moon's riches of gold, should they actually prove to exist, to fall into the hands of businessmen and not visionaries and idealists!" It's a statement of intent that I have no doubt would prompt nods of agreement in the modern corporate world. Cinematically the first hour is engaging but largely functional and unhurried, with some long held wide and mid shots broken up by flourishes in the framing and editing: the timber column that visually divides Wolf from the Professor until the latter agrees to share an offered meal; the speedy track that locks on to Gustav and Wolf's chauffeur as they pursue a stolen car; the extraordinary match cut in which Turner reveals his talent for disguise, a moment that had me leaping for the rewind to see how it had been achieved. There's even a brief burst of comedy that succeeds by concealing what's happening just out of frame, as Wolf makes a call on a neighbour's phone and distractedly snips at flowers with scissors he has picked up from the desk in front of him. A similar sense of adventure is evident some of the inter-titles, which are occasionally animated in inventive and expressive fashion in the manner of the subtitles in Fox's recent English language release of Timur Bekmambetov's Nochnoy dozor [Night Watch] and Dnevnoy dozor [Day Watch], with Turner's predictions of destruction blown to pieces by an explosion, and the Professor's joyful discovery of lunar riches announced as an animated shout of "Gold!" that visually echoes across the landscape. But the most startling early scene has to be the meeting of the five capitalists, not so much for their self-interested musings but the scientific detail provided on the upcoming flight, a collection of photographs, diagrams, models and even explanatory animations that are so close to how some of the early space missions played out – including the exact slingshot route taken by Apollo 8 – that you can't help thinking that a file full of NASA documents from the late 1960s fell through a time warp and landed on Lang's desk. This is carried through to the launch itself, a blend of model shots, grand sets and process work that, aside from the pre-launch immersion of the rocket in water, is remarkably close to how it later happened, from the G-force of take-off and subsequent weightlessness to a three-stage rocket in the mode of those actually used to send men to the moon. There are even views of the moon's surface from the spaceship that mirror the images with which we have become familiar from the Apollo flights. A key influence here was undoubtedly Lang's collaboration with Hermann Oberth, author of the first complete published concept for space travel and whose colleagues included the 18-year-old Werner von Braun, one of the fathers of modern rocket technology. Once the group reach the moon this scientific realism takes a bit of a hike. A breathable atmosphere is discovered by lighting a match outside of the ship, and base camp is set up in a large tent on the lunar surface. But like the cardigans and suits that serve as clothing for the journey, there's a sense that, so many years in advance of actual moon missions, such elements were as much educated guesswork as fanciful drama (we'll ignore the fact that scientific opinion of the time had the moon as an airless body). Even here there are forward-looking details, with weighted boots used to compensate for the lower lunar gravity and a filmic record made of the mission, while the discovery of young stowaway Gustav even completes the family unit so beloved of later US fantasy TV shows such as Land of the Giants and Lost in Space – they even have their very own Dr. Zachary Smith in the shape of the scheming but space-weak Turner. Either way, it's in this lively second half that the film really comes into its own – the pace is tighter and the drama more involving, and despite the pleasures offered by the build-up it's the mission itself for which the film is chiefly remembered and celebrated. Fans of silent cinema, early science fiction and the work of Fritz Lang should find plenty to delight in here, and for its future predictions alone, Frau im Mond deserves recognition as an important work in genre and film history. It may be daffy and a little overlong, and it's unlikely to achieve the iconic status that Metropolis has rightly enjoyed, but it's also a genuinely visionary and effortlessly enjoyable slice of future past, and one whose blend of informed scientific theory and pure dramatic hokum is virtually without peer. Another extraordinary restoration job by F.W. Murnau-Stiftung (see also the Masters of Cinema DVDs of Murnau's Tabu and Nosferatu). Frau im Mond looks terrific here, with hardly a trace of frame judder and generally fabulous contrast and picture detail. Grain is evident throughout and some damage is still clearly visible, but for the most part has been minimised or repaired. There is brief evidence of the digital domain in which the restoration has taken place in the shape of a newspaper article whose text has lost clarity in a manner that only digital processing can inflict. The piano score is the sort you'd have probably heard on the original cinema release, but newly recorded at a pleasing clarity and quality. A short but typically thorough documentary on the film, once again made by Luciano Berriatúa for F.W. Murnau-Stiftung and Transit Film in 2006. It's packed with interesting background detail on the production, with the information on Hermann Oberth and his working relationship with Lang (the advertising budget for Frau im Mond was used partly to fund Oberth's design for the world's first liquid fuelled rocket) being particularly fascinating. The parallels between the film's moon mission and the real thing are examined by directly comparing the two, but the film's ending is revealed here, so this is definitely one for after the main feature. That the usual MoC booklet is a little slimmer than the ones that accompany Tabu and Nosferatu is hardly surprising given their relative fame and the essays and documentation those films subsequently generated. The main essay here is Frau im Mond and the Fritz-Lang-Film – A Formal Analysis by Michael E. Grost, which is nowhere near as stern as that title makes it sound. Grost looks at the politics of the film and its use of media, clocks and shape symbolism, as well as its influence on director Edward G, Ulmer, he of the 1934 The Black Cat, something of a favourite on this site. A Frau im Mond Casebook collects snippets from three critical sources, specifically Jacques Rivette, Lotte H. Eisner and Tom Gunning, and rounds off with a couple of quotes from Lang himself, the second of which is as amusingly idiosyncratic as the film. Frau im Mond is exactly the sort of film that I love to see on the Masters of Cinema release schedule. It doesn't have the bankable status of a classic and for most will be a title they've either never heard of or only read about in passing, while its oddball blend of styles and genres is unlikely to act as an instant hook. And yet it's the peculiarity of that mix that gives the film its unique charm, particularly its hybrid of the fanciful and the scientifically precise. The deal is sealed by another superb restoration job from F.W. Murnau-Stiftung, who are starting to blaze a trail for the reconstruction of European silent works of note. Frau im Mond may be an odd one, but it comes recommended nonetheless.